THE Gunners edged a step closer to retaining their Premier League crown on Thursday with their second consecutive 3-0 win over Birmingham. Star striker Lianne Sanderson, who scored twice against the Blues in Arsenal’s previous home win at Meadow Park, opened the scoring on 15 minutes to net her 40th goal of the season. Fellow England star Kelly Smith doubled the advantage when she rifled home a stunning long-range effort, before former Birmingham player Karen Carney rounded-off the scoring. Vic Akers’ side are now 14 points clear at the top of the table, although rivals Everton could reduce the gap to five points if they win their games in hand. 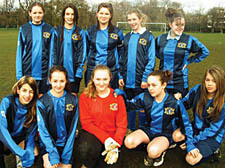 HOTSHOT Tara Campbell scored four goals as a depleted Hampstead girls’ team rounded off their league campaign with a comprehensive victory over Ruislip Rangers at Regent’s Park. Starting with only two recognised defenders, Hampstead proved that the best form of defence really is attack as they eased to a resounding 9-0 win. Shauna Magner bagged a brace, while strikes from skipper Lucy Headford, Kirsty Graham and Danielle Hayes completed the rout. The result was the perfect fillip for the Under-14s squad as they prepare for their League Cup final clash against Hemel Hempstead on Sunday, April 27.